CLEVELAND — Results of testing from the Good Friday spill into Lake Erie have confirmed lube oil as the previously unknown substance. The oil is ninety-three percent mineral oil which has toxicity levels on par with baby oil. 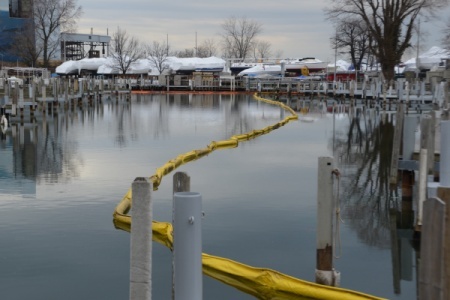 Crews have been on site around the clock since last Saturday cleaning the oil from the containment area near the Yacht Club. The remaining product continues to be captured and removed by responders as well as dissipate through natural processes. The rainbow sheens currently visible represent significantly thinner layers of oil as the remaining amount of spilled product continues to be reduced. With this progress, the tanker trucks and skimming boats have been replaced with Pom-Poms and other collection techniques to absorb the remaining oil on the surface. Cleveland Public Power has accepted the role of responsible party for the cleanup. Coast Guard pollution responders from Marine Safety Unit Cleveland and a contractor from Clean Harbors remain on scene to monitor the situation.